Have you ever wanted to be a rock star? Like a real guitar smashing, head banging rock star? The head banging may be optional, but the guitar smashing isn’t with this new Klein RockIPA beer. 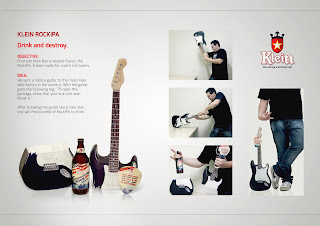 To promote their RockIPA made for rock ‘n’ roll lovers, Klein sent a replica guitar to major beer distributors with a tag that reads, “To open this package, show that you’re a rock star. Break it.” That's a clever promotion!! Smash and enjoy! Very cool.. now that is thinking out of the box! I want one! You can keep the beer. I just want the guitar. Yeah. Nice one. Love the ad. For most rock star wannabes? Yeah this will definitely fulfill their dreams big time, and with a great reward - a bottle of beer to cap the rockstar dream. Pretty cool idea and I love it. but I'm not gonna purchase one.